When disaster strikes a Southeast Alaska community, emergency planners urge residents to rely on their own stockpiles before turning to the state’s new food caches. Anchorage and Fairbanks will soon host two new food caches to connect Alaska communities with easy-access food and water after a disaster. The stockpiles are one facet of Governor Sean Parnell’s plan to strengthen disaster response infrastructure statewide. The state is not setting up a food cache in Southeast Alaska, but supplies will still be available for communities in the region. Tom Mattice is the emergency programs manager in Juneau. Mattice says the statewide emergency infrastructure puts Alaska ahead of much of the country. He says Southeast towns can take care of neighboring communities reeling from disaster. The Southeast Alaska Metropolitan Medical Response System coordinates about a dozen disaster response teams, located in Haines, Yakutat, Juneau, Wrangell, Petersburg, Skagway, Sitka, Ketchikan and across Prince of Wales Island. Mattice says they share seven shelters and supply centers, each with cots, heating systems, as well as medical and quarantine supplies. The shelters also have generators that can power buildings. The teams meet about once a year to train. 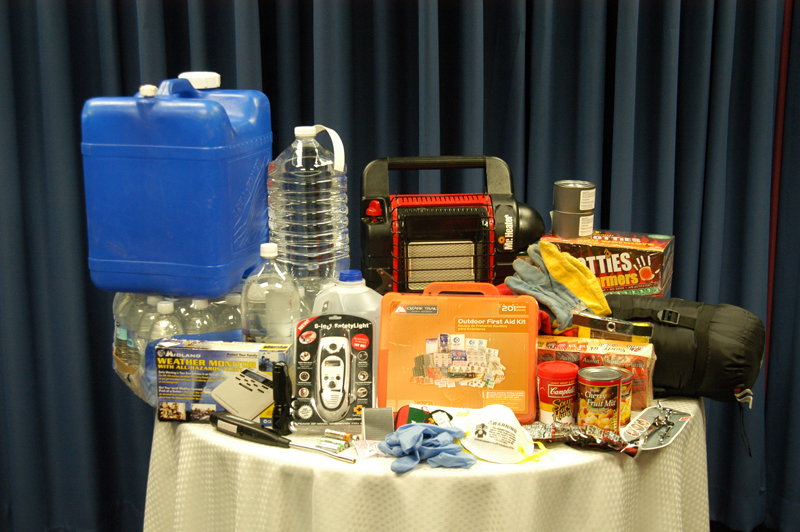 The Alaska Division of Homeland Security and Emergency Management is pushing residents to be better prepared. Mattice says short delays in food delivery are nothing new to Southeast residents. He says individuals should have a week’s-worth of food stored, and grocery stores keep a week or two of food in stock. Mattice says it’s unlikely a storm could cut Southeast Alaska from food for that long. After people empty out local grocery stores and their personal pantries, communities can turn to the state. The state awarded Anchorage-based Select Medical Products, Inc. with a four million dollar, five-year contract to create food caches in Anchorage and Fairbanks. Jeremy Zidek is the public information officer for the Alaska Division of Homeland Security and Emergency Management. Zidek says together, Fairbanks and Anchorage will have enough food to feed 42,500 people for seven days. “But it may be used on a much smaller scale, say a rural community is hit and their grocery store is destroyed, and many of their homes are destroyed, and people are without homes, without food,” Zidek says. Zidek says commercial or military partners would distribute the food to rural communities. The food is divided onto pallets, each able to feed eighty people for a week. Zidek says ten percent of pallets have age-or lifestyle-specific foods, such as baby food or salmon. If there are brief delays in transporting state resources, Mattice says the onus is on individuals to make sure their homes are ready for an emergency, and to pressure local businesses to provide employees with emergency supplies. “And in the end, responder readiness starts at home. Personal preparedness leads to responder preparedness leads to business preparedness leads to community preparedness, and we all need to do our part,” Mattice says. Under the new contract, Select Medical Products will move one-third of the food to the storage facilities by the end of the year. The contractor will deliver the rest of the food over the next three years.